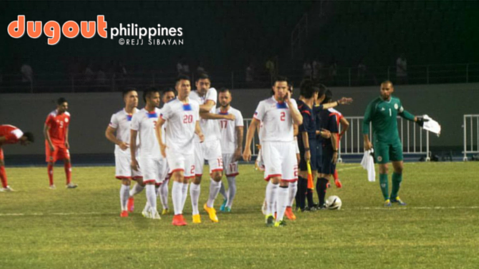 MANILA--The Philippine Football Federation had called up 35 players to its training camp ahead of its last two matches in the joint World Cup and Asian Cup qualifiers on Monday. It was a mixture of neophytes and veterans in international stage as Coach Thomas Dooley welcomed the return of captain Phil Younghusband from suspension while also lamenting that he will miss Global's Misagh Bahadoran and Ceres' Manny Ott due to the same reason. Of the 21 who went to the first session at the McKinley Hill, 11 of those who called up were debutants with Stallion, Global, and Loyola contributing the most with three each. Kaya's Joven Bedic and Dominic Del Rosario also had their debut in the camp as well and might feature for their AFC Cup match tomorrow against S-League's Balestier Khalsa. Omid Nazari headlines Global's contribution of nine booters as he tries to make the switch from Iran to the Azkals official. Nazari also joins U19 standouts Marco Casambre and Mark Winhoffer, who also make their debut in the camp. The reigning league champions had six Busmen called up as they will join on the 19th along with Kaya's OJ Porteria and Kenshiro Daniels as they are with their respective clubs during their AFC Cup matches. Daniel Gadia of UP and FEU skipper Paolo Bugas represented the collegiate booters in the list, despite being included into Loyola and Global's lineup for the season respectively. Walsall's Neil Etheridge and Tractor Sazi's Iain Ramsay lead the overseas list for the Azkals as they prepare for the last two matches, away to Uzbekistan on March 24, and at home against North Korea five days later.